Mark Clark of Monroe plays the lottery, most of the time buying instant tickets during store visits. This one time when he delivered fuel to the 127 Party Store at 4938 South Meridian Road in Hudson, he took the time to buy instant tickets. Usually he just scratches the bar code and uses the machine to scan the ticket to check if he had won. But this time the machine put out a message saying see the store clerk. The store owner himself scanned the ticket and advised Clark to claim his prize from the lottery headquarters. 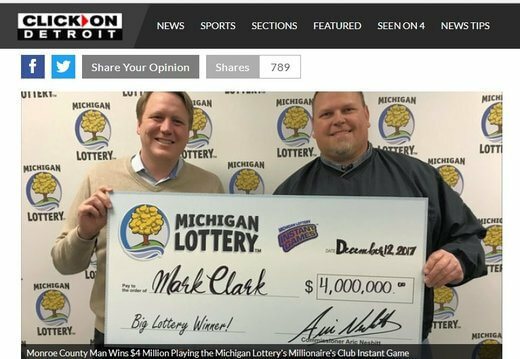 The store owner also scratched the rest of the ticket and discovered Clark had won $4 million. After a short celebration, he went back to work and then told his family the good news. He later chose to receive a single payment of $2.5 million in lieu $4 million in total annuities. Now he’s looking forward to his windfall funding a comfortable retirement. He’s also looking forward to buying a vehicle for himself and for his son, and buying a bass boat.